Ex-Manchester United captain Steve Bruce insists that the club must back Jose Mourinho over Paul Pogba to avoid ‘anarchy’ behind the scenes. The ongoing dispute between the United boss and the French midfielder escalated significantly last week, as the two men reportedly fell-out over Pogba’s comments in the media following the team’s 1-1 draw with Wolves eight days ago at Old Trafford. The 25-year-old condemned the Red Devils for a lack of urgency and attacking threat, which prompted Mourinho to strip him of the vice-captaincy just hours before his men lined up to face Derby County in the Carabao Cup. United lost that match on penalties and followed up that result with a shocking 3-1 defeat against West Ham United on Saturday, which ensured the team equalled their worst ever start to a Premier League season. Mourinho’s side are now nine points behind their arch-rivals Manchester City at the top of the table and look like a fading force under the Portuguese tactician’s stewardship. 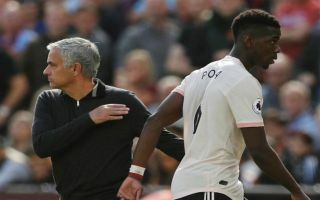 However, Bruce – who currently manages Aston Villa in the Championship – is adamant that the 55-year old coach should not be undermined in his dispute with Pogba, insisting that player power can tear a club apart from the inside. “I worked under the master, Sir Alex Ferguson,” said Bruce, as per the Daily Mail. “He had that respect. As ­players, we didn’t always like it – but we respected him. “If that relationship doesn’t exist any more, well, the lunatics will be running the asylum. Next up for United is Champions League group stage clash with Valencia at Old Trafford on Tuesday, before another home game in the Premier League against Newcastle the following Saturday. Both games are must win for Mourinho and he will need Pogba to be at his best if the team is to pick up maximum points. The Red Devils are in crisis and supporters will be praying for a better week to stabilise matters at the club, at least for the time being, heading into a busy month of fixtures in October.